Rules and regulations for water and septic systems can be different for each county and municipality . The following provide links to the different government webpages regarding guidelines, applications and requirements. The North Carolina State official rules can be found here. 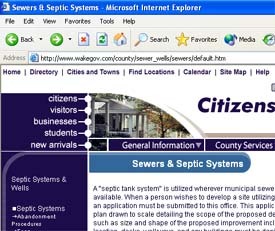 Wake County Sewers and Septic Systems page, containing links to septic applications, regulations and installers. Orange County Environmental Health Division page, including septic system and well water information. Durham County Water and Waste site, which gives links to several water and septic service information pages. the Safe Drinking Water Hotline at 1(800)426-4791.